The Buffett System. Learn how to invest like Warren Buffet. Complete with a worksheet to assist you, the eBook is developed to show you exactly how to invest like famous investor Warren Buffett. Darrin Donnelly, the developer of The Buffett System, says that there are many guides available on the market that tell you a lot about Warren Buffett, but they don't tell you how to invest like him. The book guides you towards the shares to invest. You will be asked simple questions about the companies you are considering. After checking some numbers you will be told right away whether it is worth your investment. You will also be told the right entry and exit prices. The Buffett System is a long-term investment method based on the tried and tested investment strategies of multi-billionaire investor Warren Buffett. The Buffett System was created by Darrin Donnelly after meticulously researching 50 years of investment strategy information on Warren Buffett. The Introduction of this book boasts that it is a "step-by-step guide - complete with a worksheet to assist you" which will show you "exactly how to invest like Warren Buffett... RIGHT NOW!" This sets quite high expectations from the start, but it does exactly what it says on the tin. While it does focus on US companies, the actual system can be replicated on any listed company and stockmarket in the world. The book starts off with some concepts including visualising your shares as companies, not just symbols and prices, diversification and your company's "moat" as well as the three biggest mistakes investors make. 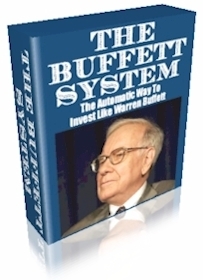 The Buffett System include several "value screeners" so as to find a place to start. This is extremely important as a journey is difficult to end if there is no starting point. The "Crunching the Numbers" section covers the actual roadmap of picking out the right numbers lending to fundamental analysis and processing them. Due to the importance of this section, several screen shots are included to assist you when finding your way to find the information required. The "Valuation" section sums up the preceding chapters and lead us right to the decision of whether or not to invest with some minor computations, with the aid of a particular online calculator designed to facilitate us. With regards to selling, the guide states: "we won't be offering any vague advice here" and it's true - the book gives another simple process to make it possible for you to decide whether to hold or sell. The book finishes with some appendices i.e. a worksheet which provides the template for one's investments, suggested reading etc. Overall, I found this an excellent book and would highly recommend it to either a novice or experienced investor seeking a worthwhile, profitable system for picking out shares to include in your portfolio. You may also want to consider The New Buffettology book, which I review HERE.